Private west facing pool and sun deck. 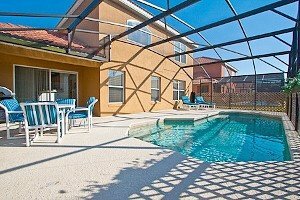 This premium luxury 5 bedroom villa is located on one of central Florida's newest communities, Solana Resort, just 12 mins from Disney, and 2 mins from shops and restaurants. 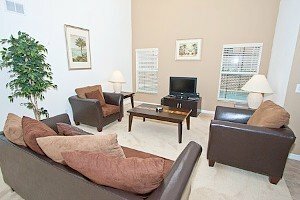 Solana is a secure, gated community with 4,000 sq ft clubhouse, heated pool, spa, mini golf, soccer, executive lounge, games room, DVD rental, WIFI etc. 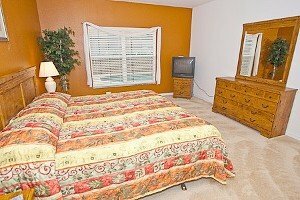 The villa is modern, clean and has a west facing sun deck with loungers and a private pool, ideal for relaxing after a long day at Disney! The main living area is situated towards the rear of the property. It has brand new 3 seat sofa, plus 2 x single chairs. There is a wide screen Plasma TV with DVD and Dolby Surround Sound system. PLAYSTATION PS GAMES CONSOLE AND GAMES!! 1 x King with ensuite, TV, Corner Bath, Separate shower room, WC, Walk in dressing room. Everything you need for an amazing stay. 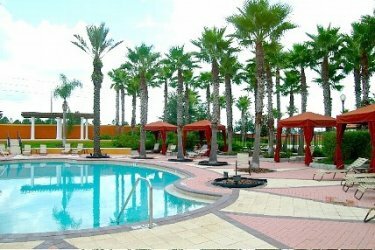 This is a gated community with clubhouse spa, games room, mini golf, kids play area, Internet PC's, WIFI etc. West Facing Pool and Deck with Balcony seating (shade). Table, Chairs, Sun-loungers and Beach Towels provided. NEW! BBQ GAS GRILL! !